Here's a neat picture from @UWCIMSS, which shows a satellite image from early AM Wednesday across the Great Lakes Region. If you look close you can see the city lights of many major metropolitan cities from Minneapolis to Chicago and Detroit. Of course, thanks to the recent cold air, there are a number of lake effect snow bands that have developed across the Great Lakes, which you can see as individual cloud bands there. The other interesting thing to note is the recent snowfall across Minnesota, which can be seen near the city lights the the Twin Cities. You can still see the cold front! It certainly wasn't hard to pick out on Wednesday as it moved into the Eastern US and stalled across the northern Gulf Coast. Note how much cooler it from AM Tuesday to AM Wednesday behind the front fromt the Great Lakes to southern Texas. Some spots were almost 20F to 30F colder... BRR! The 850mb temp anomaly loop below shows the MUCH cooler air mass continuing to move in across the eastern half of the country. Temperatures will remain well below average for much of the eastern half of the country through the weekend ahead. However, note the warmer than average temperatures hanging on across much of the Western US and also moving in across the Front Range of the Rockies/Plains. High temperatures on Thursday will be quite a bit cooler than what most of started with during the first few days of December. The potent cold front will continue surging east, which will allow MUCH cooler air to punch into the southern and eastern parts of US through the rest of the week. This will be the first time in a while that much of the eastern two-thirds of the nation will be dealing with below average temps. It might actually feel a little more like winter! The potent cold front responsible for the big cool down across the eastern two-thirds of the nation will continue to settle south through the end of the week. Widespread areas of rain will continue to fall along the Gulf Coast and into the Mid-Atlantic with a few areas of wintry precip deeper into the cold air mass. 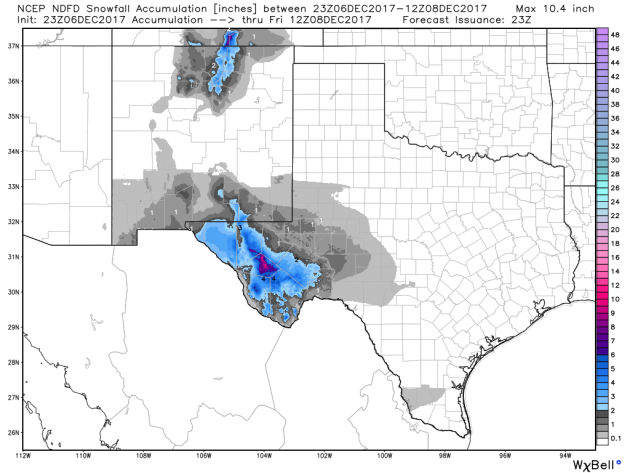 Note that areas of snow across western Texas will begin to taper Thursday, while areas of light wintry precip will still be possible in some areas of the Southeast by Friday. The coldest air will be found across the far north, where lake effect snow showers will continue through the end of the week/weekend ahead. Meanwhile, the Western US will remain quite warm and dry over the next several days. 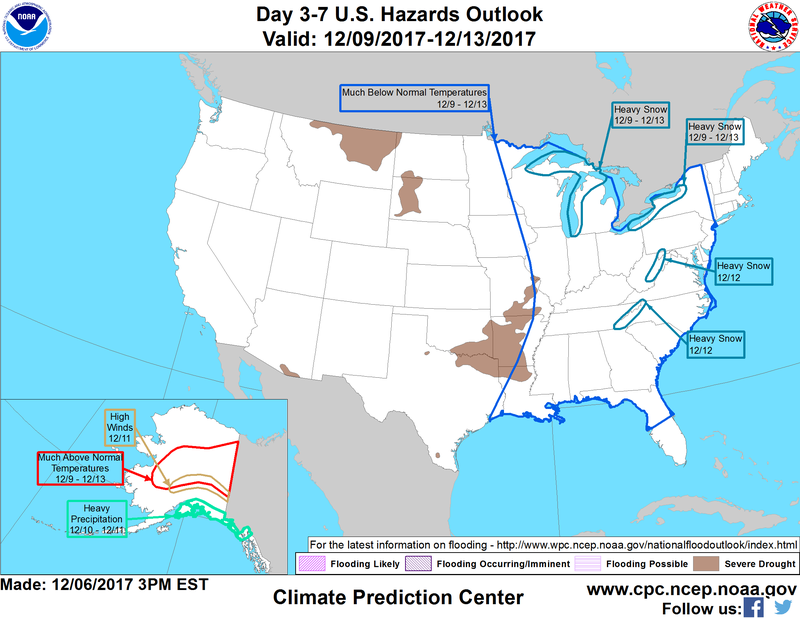 According to NOAA's WPC, the 5 day precipitation outlook suggests areas of heavier precipitation moving through the eastern third of the nation and along the Gulf Coast in association with the potent cold front. Note that some of the heaviest precipitation could approach 1" to 2"+ along the Gulf Coast, while some 2" to 3"+ tallies can't be ruled in the eastern Carolinas. Cold air will continue create lake effect snow across the Great Lakes region over the next several days, where several inches of snow maybe possible. Some of the heaviest tallies could approach 1ft to 2ft. 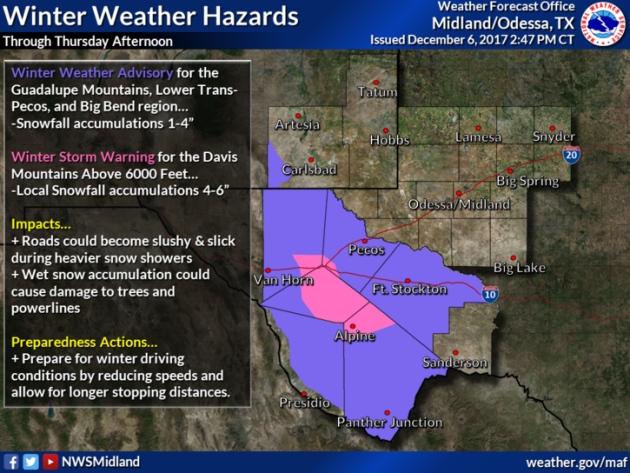 Snow will also continue across parts of Texas through Thursday. "California's worst fire season just got even more terrifying"
"Barely two months after wildfires swept across California wine country, a strong Santa Ana wind event propelled fast-moving flames across Ventura County, California on Monday night, killing at least one and destroying more than 100 homes. The blaze, known as the Thomas Fire, expanded from nothing to 45,500 acres in just a few hours thanks to fierce Santa Ana winds. As of Tuesday morning, local time, the fire was 0 percent contained. The strong winds fueling and spreading the blaze also caused power outages, plunging thousands of residents of Santa Barbara and Ventura into the dark as flames rushed in. The fire has come close to downtown Ventura, a city of more than 100,000 people about 60 miles northwest of Los Angeles. Social media images taken by evacuating residents show nightmarish scenes of onrushing flames. According to the Ventura County Fire Department, 27,000 people have evacuated. One of the structures that succumbed to the fast-moving flames was a large apartment complex." "Extreme Holiday-Season Fire Threat Puts Southern California on Edge"
“The upcoming (relatively) cool but extremely dry Santa Ana event poses a particularly high risk of fast-moving wildfires due to the incredibly dry start to the rainy season down in Southern California this year,” Daniel Swain (California Weather Blog) told me in a Twitter message. “Vegetation in most places is near peak summer dryness since it simply hasn't rained yet in any meaningful sense, and the very strong winds combined with the extremely dry air mass associated with this offshore wind event is a very serious fire weather setup,” Swain said. “Of course, if there are no fire ignitions, we may dodge a bullet. But as we saw in Santa Rosa back in October, late-season dry offshore wind patterns are the ones to watch for when it comes to dangerous California wildfires.” The state’s North Bay region is still reeling from the multiple fires that grew to catastrophic levels during an overnight bout of very high winds. The Tubbs Fire alone caused more than $1 billion in damage and killed 22 people. All told, the wildfires were the deadliest and most destructive in modern U.S. history." "Meteorologists Warn of Powerful Santa Ana Wind Conditions Not Seen in Many Years"
"The National Weather Service predicts powerful Santa Ana winds to and low humidity take hold in Southern California over the next week, increasing the risk of wildfires throughout the region. 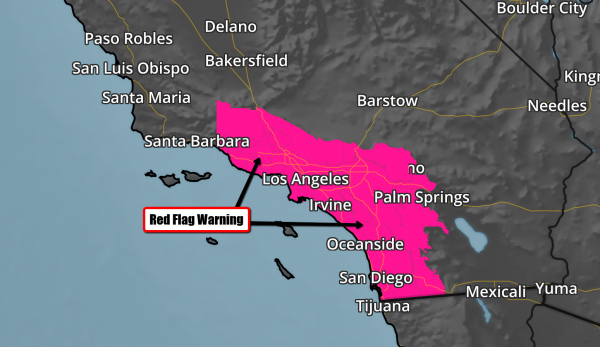 The predicted wind event, with forecasts of gusts as high as 65 mph in the San Diego County mountains, prompted the NWS to issue a red flag warning and the San Diego Fire-Rescue Department to increase staffing. Fire officials said several years of drought coupled with heavy rains last winter created significant fire fuel in the form of underbrush and grass. And because of a lack of recent rain, all of the fuel is extremely dry and ready to spark, officials said. “Meteorologists at the National Weather Service have not seen models for a Santa Ana event like this in many years,” said San Diego Fire Chief Brian Fennessy. “We are being vigilant in up-staffing to protect San Diegans and their property. We ask that residents practice their evacuation plans and be prepared in case of a wildfire.”"
Governor Jerry Brown has declared a state of emergency due to dangeous and rapidly growing wildfires in Southern California. Several wildfires have burned more than 65,000 acres since Monday. The Thomas Fire in Ventura county remains uncontained and has consumed nearly 50,000 with at least 150 structures burned. According to the Los Angeles Times, 27,000 people have been evacuated. Mandatory evacuations remain in place today with evacuation zones increasing. Nearly 1,100 people are battling the fire. The Creek Fire in Los Angeles County near Sylmar is uncontained and has consumed more than 11,000 acres. This fire has destroyed at least 30 homes and 2 firefighters have been injured. Nearly 150,000 people have been evacauted and Mandatory evacuations remain in place in advance of the fire. The Rye Fire in Los Angeles County has consumed nearly 5,000 acres and was 5% contained. 1,300 people have been evacuated. The Skirball Fire erupted overnight near Skirball Center and Getty Center in the Sepulveda Pass. The fire quickly grew to at least 50 acres, which prompted closures of the northbound 405 Freeway and mandatory evacuations for people living in the area. Numerous Wildfires in the LA area. 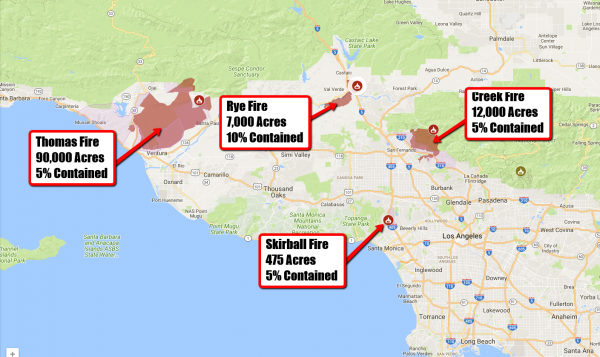 A multitude of active wildfires continue in the Los Angeles area with the most notable fires being the Thomas Fire, which erupted yesterday evening and exploded to 50,000 acres, the Creek Fire, now 11,000 acres, and the Rye Fire, which is now up to 5000 acres. The Creek Fire reportedly "jumped" over the 210 Freeway prompting mandatory evacuations as flames have been pushed down into the San Fernando Valley. A detailed, interactive map can be found here. Very strong winds and low humidity has allowed for explosive growth of the fires, which have been spreading rapidly. The ferocity of the blazes are hindering firefighting efforts along with the extreme fire weather conditions that continue. Up-to-the-minute information on these blazes can be found via Twitter: @CAL_Fire and @LACoFDPIO. Poor Air Quality. 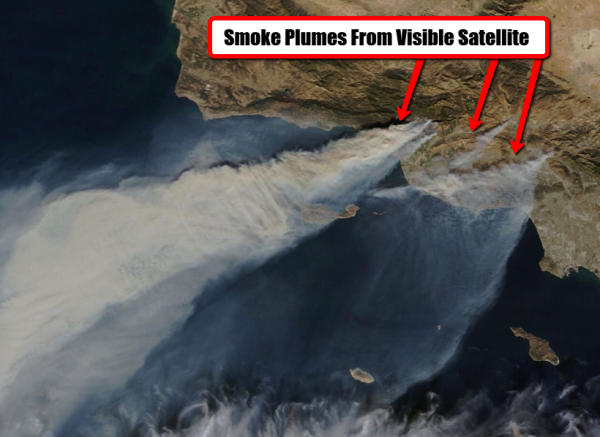 Dense smoke can be seen on visible satellite. Strong off shore flow is pushing the smoke out to sea, but communities near the blazes and downwind of the fires are experiencing unhealthy air quality--it is advised to stay indoors. Hurricane Force Wind Gusts Continue. The National Weather Service in Los Angeles stated earlier this week: "This will likely be the strongest and longest duration Santa Ana wind event we have seen so far this season which will persist through at least Thursday." 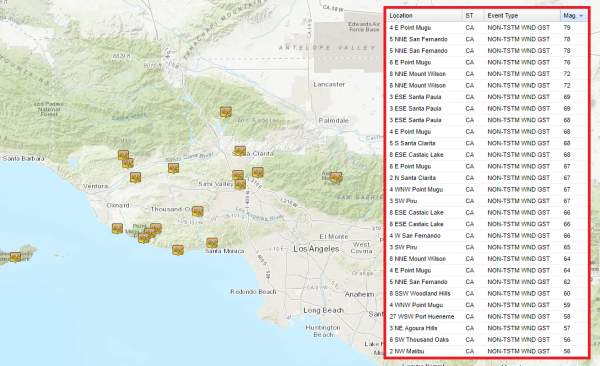 With that said, wind gusts have been reported up to 80mph in the foothills of Orange county with gusts observed up to 78 mph in Los Angeles county. Unfortunately, there won't be much change through the end of the week, so Red Flag Warnings and High Wind Warnings have been posted through Saturday. 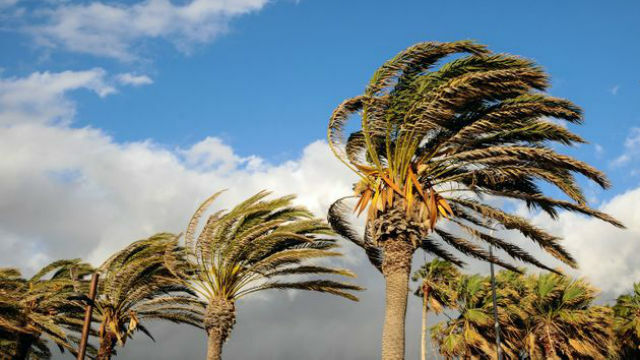 High Winds Continue: The National Weather Service continues high wind advisories through Friday as strong Santa Ana winds frequently gust at 60mph to 80mph. Not only will these winds fan recent wildfire flames, but they could also lead to downed trees and power lines. Property damage can't be ruled out along with widespread blowing dust and debris. Red Flag Warnings: The National Weather Service continues Red Flag Warnings through Friday as warm, very dry and extremely windy conditions continue through the end of the week. Red Flag Warnings mean that fire weather concerns are extremely high. 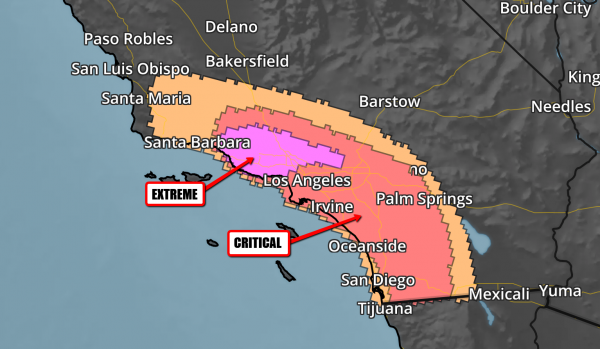 EXTREME Fire Weather Concerns Wednesday: The Storm Prediction Center keeps a fire conditions at EXTREME and CRITICAL levels in Southern California for Wednesday as the pattern remains. 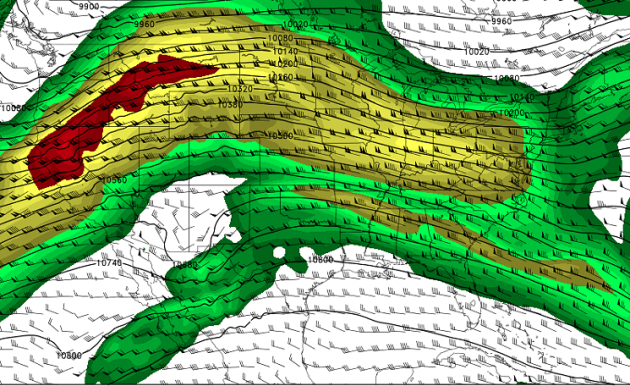 Wednesday night and Thursday, winds are expected to increase in strength with gusts between 60 and 80 mph. Single digit relative humidity continues, which marks an extended period of critical fire weather conditions for Ventura and Los Angeles counties. Long range models are now pointing to the Santa Ana winds continuing into Friday and Saturday, which is why some of the warnings have been extended. 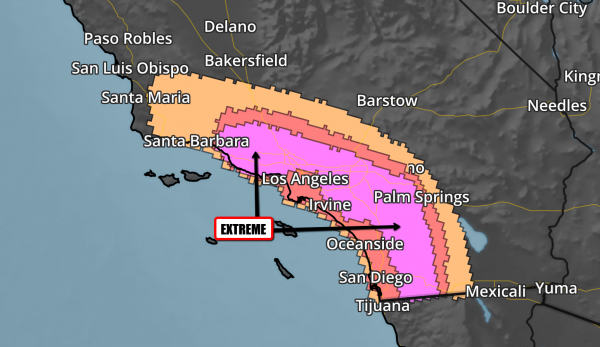 EXTREME Fire Weather Concerns Thursday: The Storm Prediction Center has extended and expanded the EXTREME fire weather concern across Southern California in advance of another surge of strong Santa Ana Winds on Thursday. Winds could gusts up to 60 and 80mph during this time. Take a look at the high temps from average in the Twin Cities from October 27th - December 4th, which shows how back and forth temperatures have been over the last several weeks. Note that from Friday, October 27th to Sunday, October 12th temperature remained quite chilly. Then we had a warm spell during the end of November into the first few days of December with temps running WELL above average. Now it looks like we'll be dealing well below average temps over the next several days as we head through the middle part of the month. Ice is once again starting to form on area lakes and ponds, but we're far from the ice being safe out there! 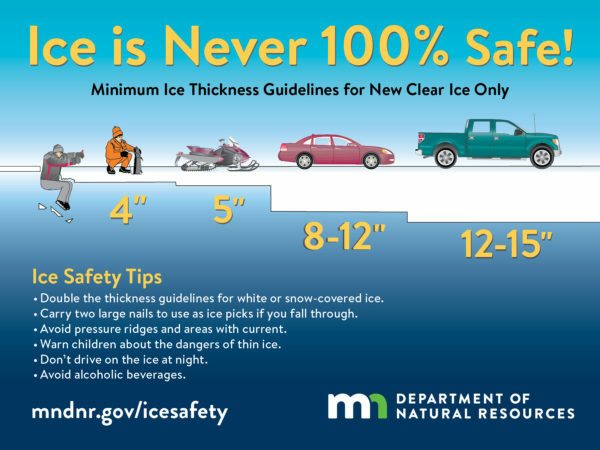 Here's an excerpt from the MN DNR regarding ice safety. Note that ICE IS NEVER 100% SAFE, but in order to walk out safely onto the ice, you need 4" of ice! 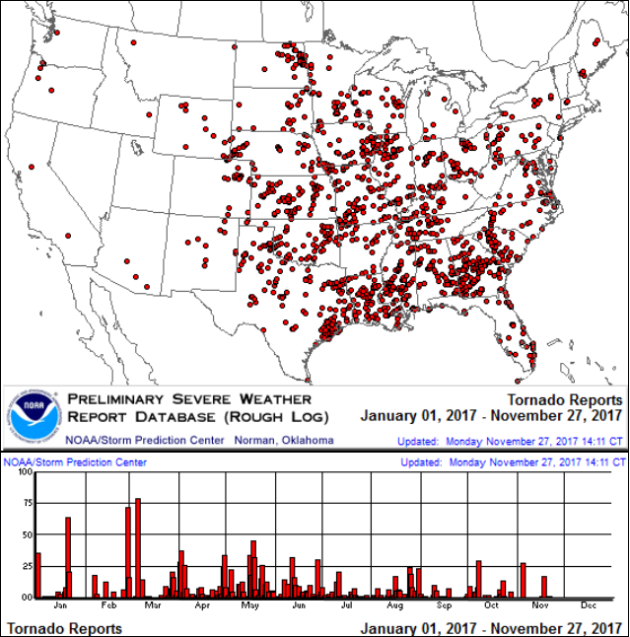 It certainly has been a fairly active first half of 2017 with 1,510 preliminary tornado reports through December 5th. Note that this is the most tornadoes through that date since 2011, when there were 1,880 reports. The map below shows the distribution of the tornadoes so far this year. According to NOAA's SPC, the PRELIMINARY 2017 tornado count is 1,509 (through December 5th). 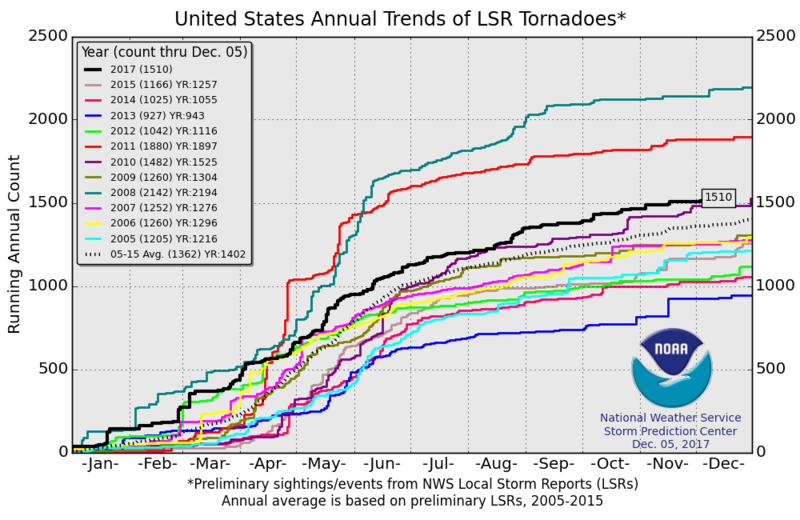 Note that is the most active year for tornadoes since 2011, when there were 1,880 tornadoes. Notice that the only other year with more tornadoes than this year was in 2008, which ended with a whopping 2,140 tornadoes nationwide. 1.) Periods of much below-normal temperatures across the eastern U.S., Sat-Wed, Dec 9-13. 2.) Periods of heavy, lake-effect snow downwind of the Great Lakes, Sat-Fri, Dec 9-15. 3.) 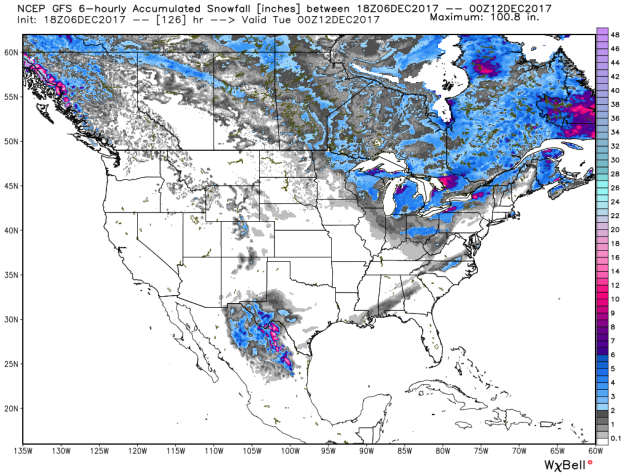 Heavy snow for parts of the central and southern Appalachians, Tue, Dec 12. 4.) Much above-normal temperatures for interior mainland Alaska, Fri-Wed, Dec 9-13. 5.) Heavy precipitation from the Kenai Peninsula to the northern Alaska Panhandle, Sun-Mon, Dec 10-11. High winds for the Alaska Range, Mon, Dec 11. 6.) A high risk of much below normal temperatures for the Great Lakes and parts of the Northeast, Thu-Sun, Dec 14-17. 7.) A moderate risk of much below normal temperatures for parts of the eastern and central U.S., Thu-Sun, Dec 14-17. 8.) A slight risk of much below normal temperatures for parts of the eastern U.S. and northern Great Plains, Thu-Wed, Dec 14-20. 9.) A slight risk of much below normal temperatures for pars of the Southeast, Thu-Fri, Dec 14-15. 10.) A slight risk of heavy precipitation from the Alaska Peninsula east to the northern Alaska Panhandle, Thu-Mon, Dec 14-18. 11.) Severe drought across parts of the lower and middle Mississippi Valley, Great Plains, Arizona, and Hawaii. Friendly flurries floated past office windows yesterday. Thankfully they were just that; not enough to create another migraine commute like we had earlier this week. The October-like temps we enjoyed at the end of November and early December are long gone. 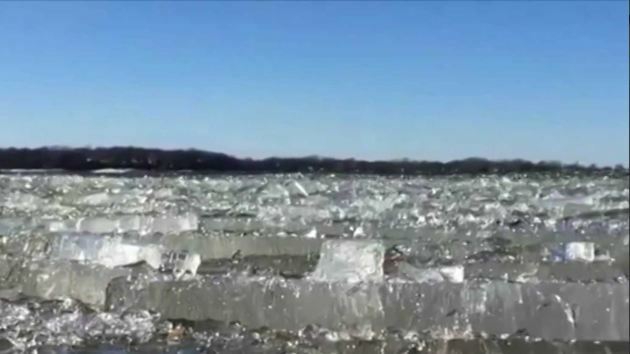 Ice is now forming on ponds and lakes in the wake of an Arctic front that blasted through earlier this week, which also brought the Twin Cities its biggest snowfall of the season. With that said, the MSP Airport has only had 2.9 inches of snow this season, which is nearly 9 inches below average. Meanwhile, Southern California is on fire aided by the strongest Santa Ana wind event of the season with gusts up to 80mph today! THURSDAY: January-like sunshine. Winds: W 5-10. High: 20. THURSDAY NIGHT: Clouds thicken. Winds: W 5. Low: 16. FRIDAY: Light fluffy snow coating later. Winds: WNW 5-10. High: 26. SUNDAY: Brief thaw. Light snow overnight. Winds: WNW 5-15. Wake-up: 15. High: 34. MONDAY: A few flakes early. Falling temps. Winds: NW 10-20. Wake-up: 25. High: 31. TUESDAY: Brisk wind chills return. Winds: NW 5-15. Wake-up: 10. High: 24. WEDNESDAY: Scattered flurries. Winds: WNW 5-15. Wake-up: 16. High: 26. 1982: Due to unseasonably mild temperatures during the preceding weeks, a farmer near St. Bonifacius is able to bail his 4th crop of alfalfa hay on this day. 1927: A blizzard hits the Arrowhead region with heavy snows and 70 mph winds at Duluth. High temps on Thursday will be quite chilly across the region once again with highs only in the 10s and 20s across Minnesota. These temps will be more reminiscent of January with windchill values in the single digits and teens for much of the day. Here's the temperature outlook through December 21st, which shows a MUCH colder temperature outlook as we continue through the next could of weeks. 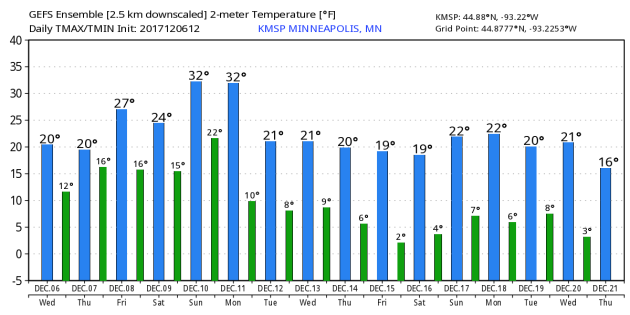 Temps will remain more January-like through the rest of the week, but could warm to above freezing on Sunday and Monday before another surge of colder air settles in next week. Here's the temperature outlook from through the 3rd weekend of December, which suggests temperatures will remain cooler than average across much of the Midwest into the Great Lakes. However, warmer than average temperatures will continue in the Western US. Here's the extended temperature outlook as we head through the 3rd weekend of December. The high amplitude and stagnant weather pattern will continue to keep colder than average temperatures in the Eastern US, while warmer than average temperatures will continue in the Western US. "One of the biggest US oil fields turns to an unexpected power source: solar"
"The Belridge oil field near Bakersfield, California, is one of the largest in the country. It has been producing oil for more than a century and last year produced around 76,000 barrels a day, according to operator Aera Energy. Now the oil field is about to become even more remarkable. Its future production will be powered partly by a massive solar-energy project to make the extraction process more environmentally friendly, according to Aera and GlassPoint Solar, the firm that will create the solar project. The Belridge field was discovered in 1911. Oil from the field flowed out of the ground because of natural pressure in the geologic reservoirs. Later, as the pressure declined, many companies said the field was exhausted. The field gained new life in the 1960s through a process known as enhanced oil recovery. But squeezing more crude oil from the Belridge requires large amounts of steam to loosen the heavy crude, which in turn requires energy. Traditionally, Aera used natural gas to heat water to create steam. Now Aera and GlassPoint will use a large, 850-megawatt solar thermal array to evaporate the water that's pumped into the ground to liberate more oil. The companies say this will offset 4.87 billion cubic feet of natural gas per year and avoid the emission of 376,000 tons of carbon. The water used emerges from the process of oil extraction itself and will be recycled and pumped back into the ground." "This New Power Plant Will Produce Clean Energy From Cow Manure"
"Japanese automobile giant Toyota is making some exciting moves in the realm of renewable, clean energy. The company is planning to build a power plant in California that turns the methane gas produced by cow manure into water, electricity, and hydrogen. The project, known as the Tri-Gen Project, was unveiled at this year's Los Angeles Auto Show. The plant, which will be located at the Port of Long Beach in California, will be "the world's first commercial-scale 100 percent renewable power and hydrogen generation plant," writes USA Today. Toyota is expecting the plant to come online in about 2020. The plant is expected to have the capability to provide enough energy to power 2,350 average homes and enough fuel to operate 1,500 hydrogen-powered vehicles daily. The company is estimating the plant to be able to produce 2.35 MW of electricity and 1.2 tons of hydrogen each day." 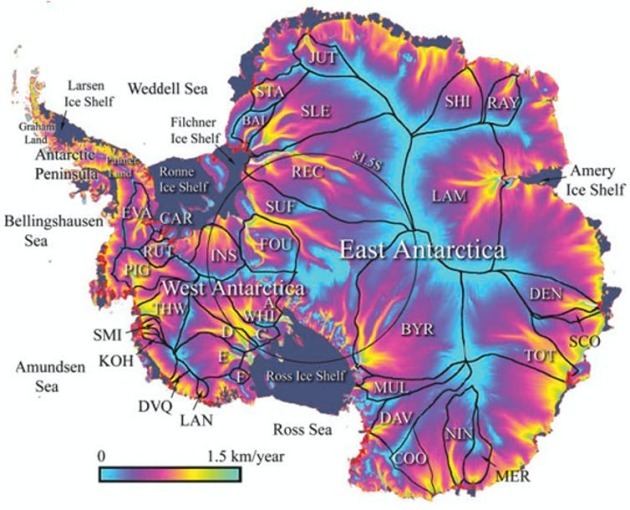 "Why remote Antarctica is so important in a warming world"
"Ever since the ancient Greeks speculated a continent must exist in the south polar regions to balance those in the north, Antarctica has been popularly described as remote and extreme. Over the past two centuries, these factors have combined to create, in the human psyche, an almost mythical land – an idea reinforced by tales of heroism and adventure from the Edwardian golden age of “heroic exploration” and pioneers such as Robert Falcon Scott, Roald Amundsen and Ernest Shackleton. 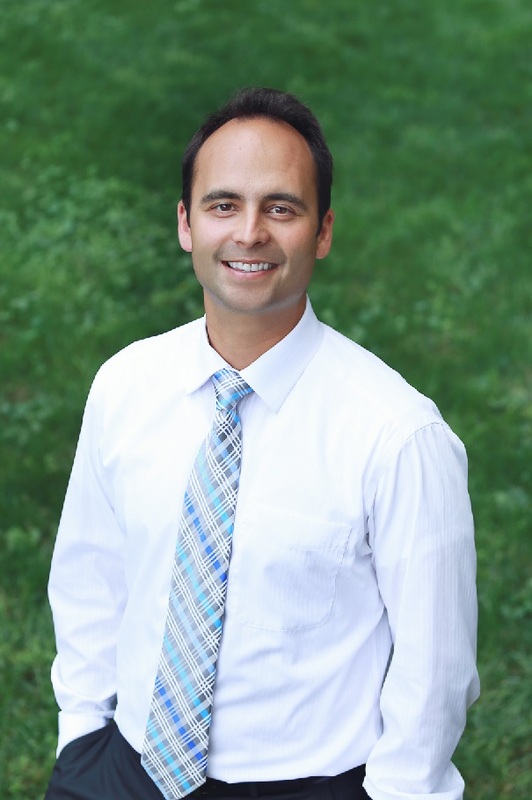 Recent research, however, is casting new light on the importance of the southernmost continent, overturning centuries of misunderstanding and highlighting the role of Antarctica in how our planet works and the role it may play in a future, warmer world. What was once thought to be a largely unchanging mass of snow and ice is anything but. Antarctica holds a staggering amount of water. The three ice sheets that cover the continent contain around 70% of our planet’s fresh water, all of which we now know to be vulnerable to warming air and oceans. If all the ice sheets were to melt, Antarctica would raise global sea levels by at least 56m. Where, when, and how quickly they might melt is a major focus of research. No one is suggesting all the ice sheets will melt over the next century but, given their size, even small losses could have global repercussions. Possible scenarios are deeply concerning: in addition to rising sea levels, meltwater would slow down the world’s ocean circulation, while shifting wind belts may affect the climate in the southern hemisphere." "A Giant Iceberg in West Antarctica Is Disintegrating, And Scientists Are Worried"
"We hope this isn't the start of something really bad. When the fastest melting glacier in Antarctica surrenders itself to the ocean, the results can be pretty dramatic to watch – and, as scientists explain, worrying. Researchers have just released a new animation depicting the ongoing disintegration of a vast Antarctic iceberg four times the size of Manhattan, which calved from the Pine Island Glacier two months ago and has been breaking up into ever smaller fragments ever since. The iceberg, which covers approximately 267 square kilometres (103 square miles), broke free of the glacier in West Antarctica in late September, and was initially expected to drift far out into the Southern Ocean before fracturing. That didn't happen though, with the huge chunk of unstable ice thought to have been impeded by a layer of thick sea ice, ensuring that the breakup is taking place only kilometres from the glacier it abandoned." "It is big, hard to get rid of, and persistent. Scary for those who love fresh snow. Yes, it is the Godzilla Ridge. One so powerful that is may be hanging around for 1-2 weeks. Strong enough to give us sun in normally cloudy December."